I have always understood that content is essential to Google and that content or blog posts with less words get penalized by Google. I try to aim for 600-800 words when possible but sometimes I just can't find enough to say. I have some posts with 250 words or less. Is this really a big problem? Does it impact my SEO? Answer: There has been a lot of debate within SEO circles as to whether Content Length really does matter for SEO. The main assertion is that content of 1000+ words seems to correlate with higher rankings. And there are several resources and studies that confirm this hypothesis. 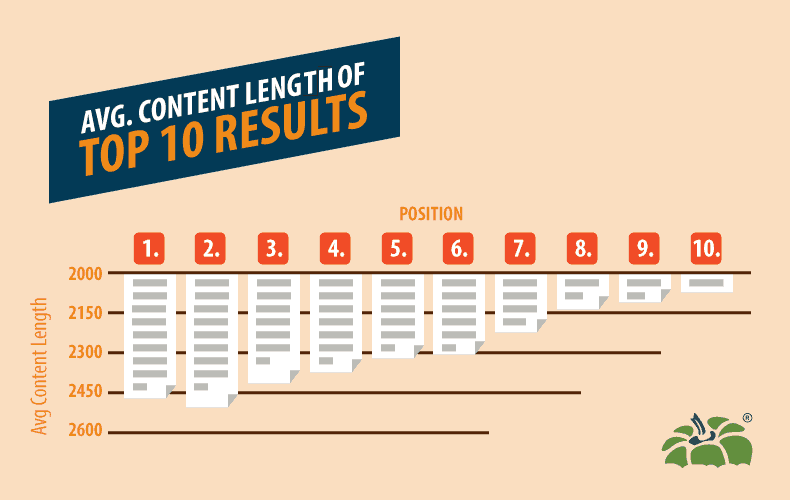 The graphic above was taken from an in-depth study done on content length in 2018, which agrees 100% with the very first studies done in 2012, that Google's page one results show a high correlation between content length and overall page-one rankings. In short, Google still values long-form content. Further, you may have heard of Google Panda. It is a content-specific algorithm that is now baked into the regular Google algorithms. It specifically targets shorter, thin content type blog posts. Now, that doesn't mean that YOU will be hit by Panda (unless that 250 words was very low-quality and unoriginal) but when people talk about "thin content" they are also talking about "short" content. And, quite honestly, 250 words is short. John Mueller (Google Web Trends Analyst) even stated way back in 2012 (six months after the first Panda Update) that short articles are fine BUT longer articles do tend to have more value.